Springfield Hospital was built as the Surrey County Lunatic Asylum and opened in 1841 on the 40-hectare Springfield Park estate. It later transferred to the MCC and was renamed Springfield Hospital. Its grounds include remnants of pioneering airing courts laid out for patients' exercise, 6 of which remain as well as formal landscaping. One of the airing courts has been created as a community horticulture project. Has taken part in Open Garden Squares Weekend 2 times, most recently in 2017. Springfield Hospital was built as the Surrey County Lunatic Asylum on the 40-hectare Springfield Park estate and opened in 1841. The building consists of a long spinal corridor with wards for patients of different medical conditions radiating off it at right angles. Enclosed airing courts for exercise were situated adjacent to the particular class of ward. Farmland and kitchen gardens surrounded the buildings, using existing farm buildings of the former estate. Landscaping such as laying out the drive, cultivating the farm and garden were completed after the asylum opened to 350 patients. It was enlarged a number of times over the decades to cater for more patients, which led to more airing courts being provided. The outer estate was also enlarged and new buildings added, such an Annexe for Idiot Children, the Elizabeth Newton Wing, in 1897. The asylum transferred to the MCC in c.1889 and later to South West London and St George's Mental Health NHS Trust, the name changing to Springfield University Hospital. Housing has been built on the south-west boundary and some buildings, such as the kitchen garden north-east of the main building, White Lodge and Elizabeth Newton Wing are now separated from the main hospital and its grounds. The remaining farmland has become a golf course. The hospital is still partially in use, but its future use yet to be decided. The grounds of the hospital include formal landscaped areas, but the particular interest is the airing courts, six of which remain around the ward wings. Largely grassed, they were planted with a variety of trees; the 3 to the north-west were for male patients, and the 3 to the south-east for female patients, these latter retaining some of their earlier layout such as paths, octagonal privies set into the walls, which had ha-ha style ditches that served to provide a secure environment, while allowing patients to have views over the landscape. Later C20th additions included a pavilion in one court on the site of an earlier covered seat, and in another a central pergola. The airing courts anticipated recommendations on patient treatment in asylums. 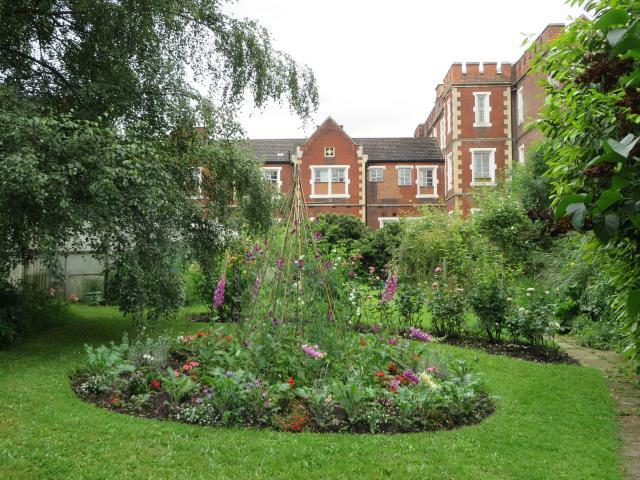 In one of the former male airing courts, which once had vegetable plots maintained by the patients, a new garden has been created by the SHARE Community Horticulture Project. The disused airing court became the Gillian Webb Memorial Garden, and is now a horticultural training project for adults with disabilities. In addition to vegetables the garden has herbaceous and shrub borders, a herb garden, pond and willow arbour with a mosaic floor.